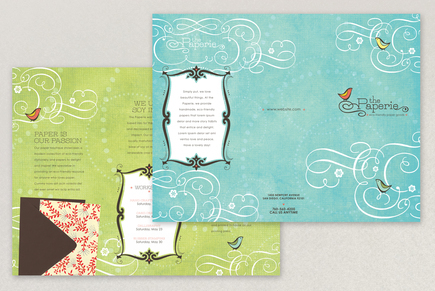 This charming and stylish brochure is perfect for an arts and crafts shop specializing in paper goods and scrapbooking supplies. The delicate swirls and birds beautifully accent the subtle handmade paper texture of the background, and the palette is sure to inspire and delight. This brochure would be an excellent way to detail available products and announce new classes.